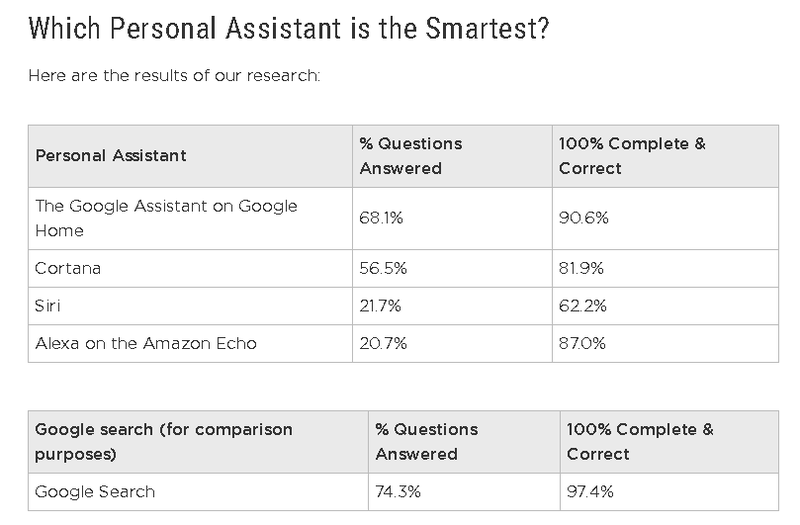 Test revealed Alphabet’s Google Assistant as the smartest among the top personal digital assistants. This victory reinforced Alphabet’s growing lead in general Artificial Intelligence. Stone Temple used 5,000 general questions to test Google Assistant, Siri, Alexa, and Cortana. Google Assistant emerged as the clear winner. Apple’s Siri posted the highest percentage of incorrect answers. ZeroHedge called Siri the dumbest smart assistant. Apple will allegedly unveil its equalizer to the Alexa-powered Echo and Google Home smart speakers during next week’s WWDC event. Years of complementary corporate acquisitions are why Google is outpacing its rivals in Artificial Intelligence. Apple (AAPL) will hold its Worldwide Developers Conference (WWDC) on June 5-9. I doubt the rumored Siri-powered smart speaker will perform better than Stone Temple Consulting’s April test of digital assistants. Stone Temple used 5,000 general knowledge questions to examine the Artificial Intelligence [AI] of Alphabet’s (GOOG) (NASDAQ:GOOGL) Home speaker with Google Assistant, Microsoft’s (MSFT) Cortana, Amazon’s (AMZN) Alexa-powered Echo, and Apple’s Siri. Alphabet spent a lot of money acquiring AI-related companies. It was no surprise that Google Assistant emerged as the smartest. Out of the 5,000 general knowledge questions asked by Stone Temple, Google Assistant answered 68.1% of them, with 90.6% complete and correct answers. Siri was only able to answer 21.7% and its accuracy was rather low, 62.2%. Alexa answered 20.7%, with 87% answered correct and complete. Cortana was the second-best, it answered 56.5% and 81.9% of the answers were 100% complete and correct. Stone Temple’s findings prompted ZeroHedge to call Siri the ‘dumbest smart assistant.’ Aside from being the least accurate digital assistant, Siri also committed the highest percentage of completely wrong answers to Stone Temple’s queries.